Cautious optimism about corporate earnings sent the stock market higher Monday. U.S. companies start reporting their second-quarter results this week, led by aluminum producer Alcoa. Other major companies that will report include JPMorgan and Wells Fargo. Analysts predict that earnings growth for companies in the Standard & Poor’s 500 index will come in at 3 percent in the second quarter. While that rate would be down from 5 percent in the first quarter, earnings are still expected to reach record levels. Investors and traders will search for evidence that companies are increasing revenues, not just cutting costs to boost profits. Sales growth is predicted to fall 0.3 percent in the second quarter. The Dow rose 88.85 points, or 0.6 percent, to close at 15,224.69. The Standard & Poor’s 500 index gained 8.57 points, or 0.5 percent, to end at 1,640.46. Dell was among the big gainers in the S&P 500 index. An advisory firm recommended that company shareholders support a plan to take the computer company private. Founder Michael Dell and Silver Lake Partners have offered to buy Dell for $24.4 billion, or $13.65 a share. Dell rose 41 cents, or 3.1 percent, to $13.44. The Russell 2000 index, an index of small-company stocks, closed at an all-time high 1,009.25. The index past the 1,000 mark for the first time Friday and has gained 19 percent this year, a sign that investors are more willing to take on risk. The gains have outpaced those of the Dow and S&P 500, which are up 16 percent and 15 percent, respectively. In other trading, the Nasdaq composite rose 5.45, or 0.2 percent, to 3,484.83, the smallest gain of the major indexes. The index was weighed down by a slump in Intel. The chipmaker fell after a Citigroup analyst wrote that weak PC sales and waning demand for smartphones would stunt the company’s growth. Intel, which makes up 2.2 percent of the Nasdaq, fell 88 cents, or 3.6 percent, to $23.18. Other chipmakers also declined. Qualcomm dropped 96 cents, or 1.6 percent, to $59.99. In government bond trading, the yield on the 10-year government note pulled back from a two-year high of 2.74 Friday. It fell to 2.64 percent on Monday. The yield had jumped after the government reported strong U.S. hiring for June on Friday. Investors believe that the improving jobs market will prompt the Federal Reserve to ease back on its bond-buying program. The Fed is buying $85 billion in bonds each month to keep interest rates low and spur borrowing and investing. For the first five months of the year stocks moved higher, supported by the backdrop of low interest rates, a recovering housing market and increased hiring. 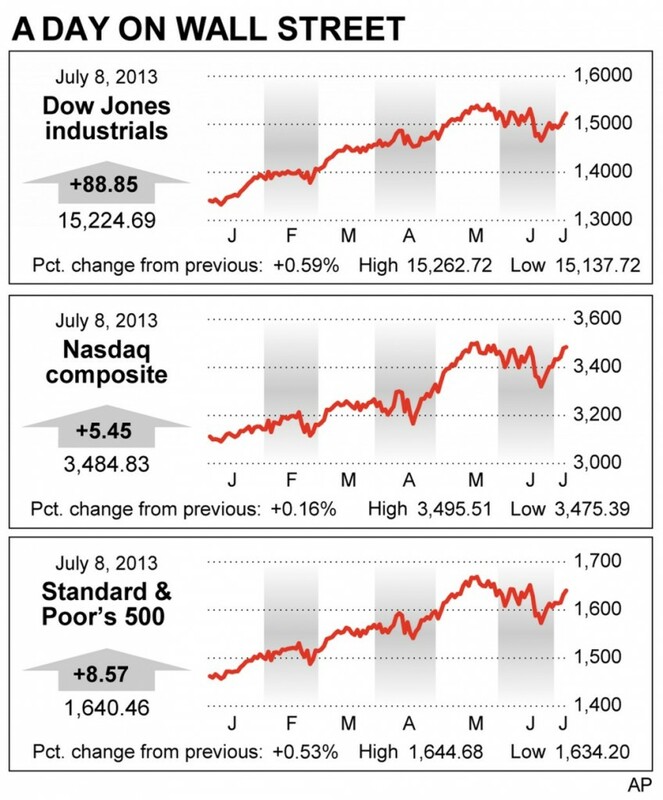 The S&P 500 index gained 17 percent by May 21 and stood at a record 1,669. But the stock market pulled back when Fed chairman Ben Bernanke said that the central bank might consider easing its stimulus. The S&P 500 dropped as low as 1,573 on June 24, about 5.7 percent below its record close. Since then stocks have gradually recouped losses as investors appear to be getting more comfortable with higher interest rates. The S&P 500 is now 2.2 percent below its May record. In commodities trading, the price of oil was little changed at $103.14 a barrel. The price of gold rose $22.20, or 1.8 percent, to $1,234.90 an ounce. After the market closed Monday, Alcoa reported a wider second-quarter loss due to weak aluminum prices. Alcoa lost $119 million, or 11 cents per share, in the April-through-June quarter. That compared with a loss of $2 million, or break-even on a per-share basis, a year earlier. Alcoa fell 5 cents, or 0.6 percent, to $7.87 in after-hours trading. Priceline rose $33.47, or 3.9 percent, to $888.60 after investment bank Morgan Stanley raised its price target for the online bookings company. Analysts at the bank believe that Priceline can climb as high as $1,010 as it continues to grow internationally and worries about shrinking profits dissipate. This article appeared in print on page 8 of the July 9th, 2013 edition of Hamodia.